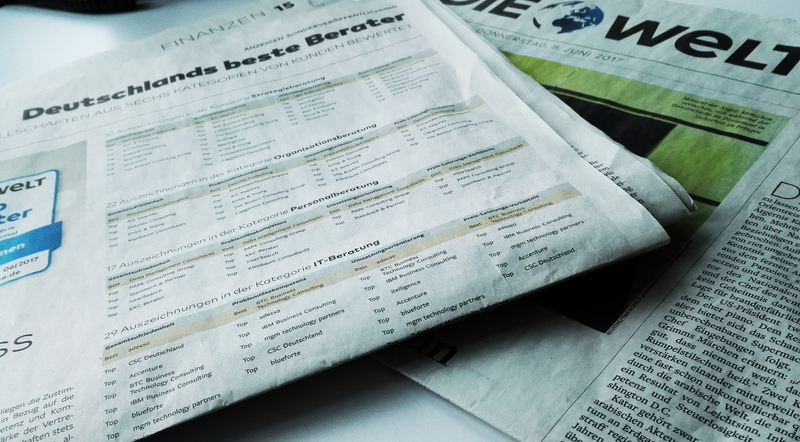 On June 8 2017 “Die Welt” published the ranking “Deutschlands beste Berater“ (Germanys best consultants). mgm has been recognized as a top consultant in all four areas of the IT consulting category: overall satisfaction, problem-solving competence, implementation orientation and price-performance ratio. The ranking is based on an online survey which took place from April to May 2017. A total of 1306 corporate clients from various sectors participated. The basic condition of an assessment was at least twelve qualified, comprehensive customer judgments.